Jeni grew up on Long Island playing competitive softball and volleyball. Playing sports sparked her interest in the body, how it moves, and how it functions best. 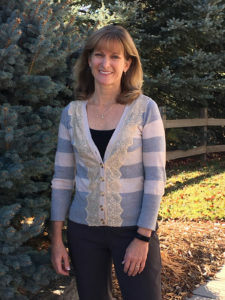 She went on to receive a Bachelor of Science degree in Physical Therapy at Mt St Mary’s University, continued graduate work in Exercise Physiology, and culminated her academics with a Doctorate in Physical Therapy from Utica College. She began her professional career working at Southern California Orthopedics and Sports gleaning information on orthopedics, pre- and post surgical rehabilitation, and especially honing her skills on shoulder and knee injuries. She has taken hundreds of hours of Continuing Education classes in Manual Therapy, Orthopedics and Sports Rehab and is certified in Dry Needling and NKT (Neuro-kinetic Therapy). She continues to expand her knowledge by taking a wide array of educational classes, and she has lectured on shoulder rehab, taught basic manual therapy, and assisted in NKT classes. Jeni believes that people are cared for best when they are treated as a whole person, and not as a single diagnosis. Jeni lives in Lafayette with her husband, Mark, and she has a son and a daughter in college. In her spare time she enjoys yoga, mountain biking, going to the gym, traveling, and reading about nutrition and health.